These Forgefix Masonry Anchor Projection Bolts have a Zinc Yellow Passivated finish for increased durability and resistance to corrosion. They have a tough and reliable construction to cover most heavy-duty fixing applications. The four-way expansion shield offers extremely strong and secure anchorage, and the specially manufactured retaining spring ensures encapsulation of the wedge during expansion. 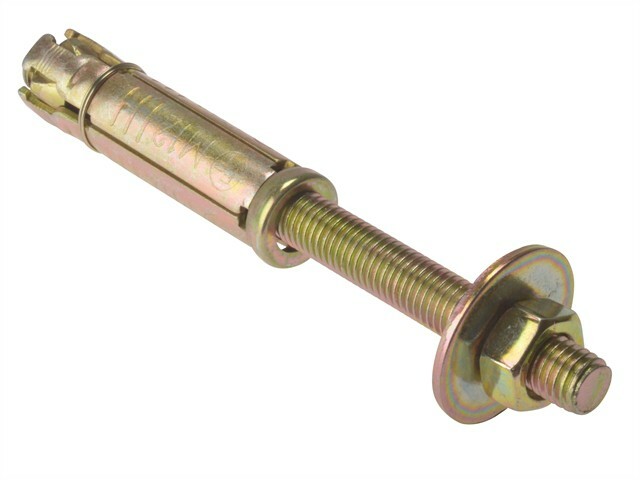 Projection bolts offer easier fixture removal or repositioning due to the bolt remaining in the shield. Ideal for securing reinforcement wall plates, lighting supports, guy ropes and bracketry. When sizing a Masonry Anchors it is most important to know the depth of the material that you are fixing. Eg: Size M610: The 'M6' is the thread size of the bolt. The '10' denotes the maximum thickness of material it will fix.